The senator remains a constant target because he said he supported speed cameras then acted to end them. Judy Kottick (left) and Mary Beth Kelly start the marathon in front of Marty Golden's Bay Ridge office. Photos by Gersh Kuntzman. They’ve talked the talk, now they’re walking the walk. Four Families for Safe Streets activists, each of whom with a loved one who was killed by a motorist, are walking a slow marathon — 26.2 miles — around the office of State Senator Marty Golden on Thursday to once again draw attention to the failure of Golden and his Republican colleagues to pass an Assembly bill that would have extended and expanded New York City’s life-saving speed camera program. Amy Cohen (right with fellow activist Bob Lesko) on the back end of the block. The cameras went dark on July 25. Golden said he supported the Assembly bill, but later proposed his own bill that would have terminated the cameras in six months. 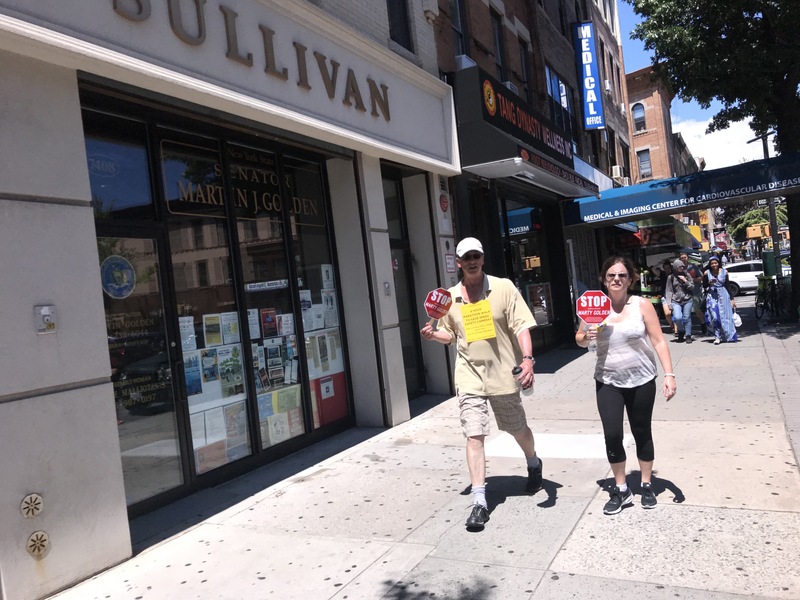 Golden has been cited for speeding 14 times in school zones and received more than $19,000 in campaign contributions from the Patrolmen’s Benevolent Association, a police union that opposes speed cameras. He also ran over a woman in a crosswalk in 2005. She died soon after. Kelly, Dana Lerner, Amy Cohen and Judy Kottick began the marathon at Golden’s Fifth Avenue office at shortly after noon and are expected to keep at it until 9 p.m. At .4 miles around the block, the group will have to do 66 laps. Andrew Gournardes, one of the two Democrats vying for the chance to take on Golden in November, did a few early laps with the group. His opponent, Ross Barkan, was expected to join later. 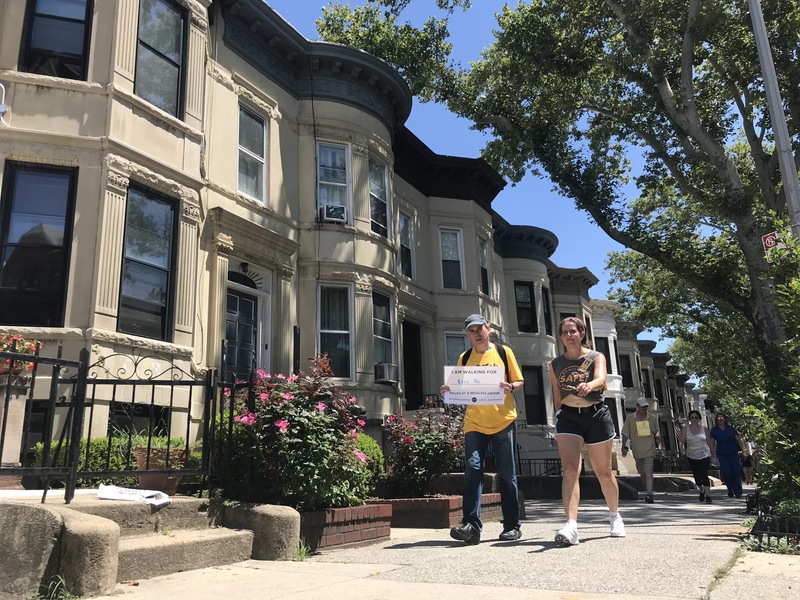 These Families for Safe Streets volunteers have been, forgive the pun, around the block a few times, so they did not think Golden would come out and address their concerns (nor did the senator respond to Streetsblog’s request for comment on Thursday). 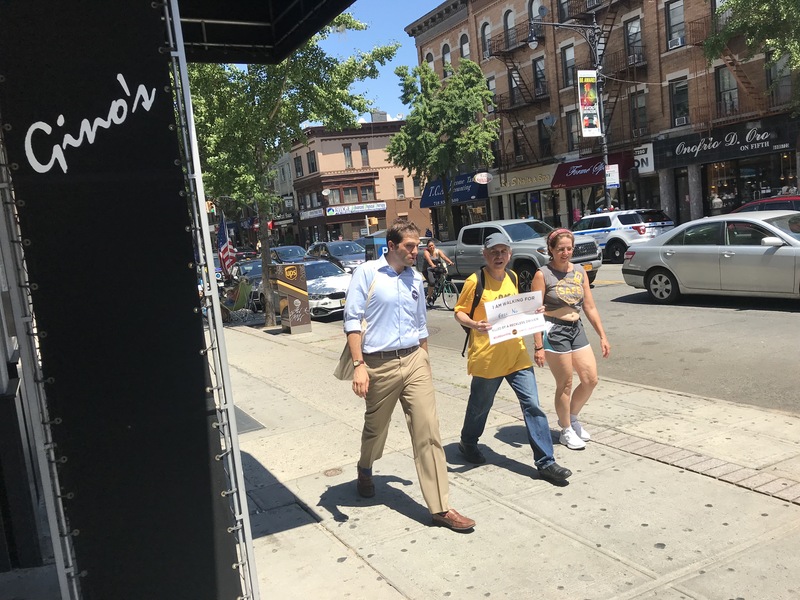 He certainly did not speak to activists when they delivered pudding to his Bay Ridge office (as in “the proof is in…”), when they held a 24-hour vigil, or even when schoolkids offered him coffee early one morning (as in “wake up and smell the…”). Lerner, a psychoanalyst, had a different diagnosis. If Golden does see himself as above the law, he’s not alone. From 2014, until speed cameras were shut off on July 25, 4,679,872 summons were issued to drivers. But none of the speeders, we imagine, signed his or her name to a bill that would extend and expand the cameras — then did nothing to get the bill passed. State Senate candidate Andrew Gounardes joined the marathon on the all-important Gino’s leg. Dana Lerner (right with John Mason) diagnosed Golden as a sociopath. While I certainly applaud and encourage the pressure being put on Golden, why not also shine the light on who the Senate is listening to here — the PBA. Time to march on their office. Don’t let Pat Lynch show his face and not answer to why he (a NJ resident) is ok with kids in NYC dying. This time the blood is on his hands. Great idea! Organize that one! I would enjoy watching that but in terms of advocacy return, Marty Golden is way more valuable than Pat Lynch. In addition to playing a direct, decisive role in the fate of this legislation, Marty has to face voters who actually support speed cameras — and soon. Pat Lynch is accountable only to his members, and we can only assume that he is doing what they want him to do. Some state lawmakers understand that speed cameras are mostly about money, not safety, and they say no to them. With luck, it will remain no. Members of Families for Safe Streets are in Albany today to talk to state legislators about expanding NYC's automated speed enforcement program. After legislative leaders failed to advance a similar bill last year, this session it appears to have more traction. NY1's Josh Robin did something no one else could do: He got State Senator Marty Golden to apologize for being such a bad driver. Andrew Gounardes Takes Victory Lap … At Vision Zero Safety Conference! Andrew Gounardes traveled 16 miles from his district to thank street safety advocates for putting him, and a central issue, on the map. At a Bensonhurst senior center, Treyger urged residents to call Golden and tell him to renew the speed camera program.